Did you know today gum disease has overtaken cavities as the leading cause of tooth loss in adults due to prolonged plaque build-up in between teeth, along the gum lines and in gum pockets due to poor brushing habits and it usually remains undetected for too long. A 2010 study indicated that 9 out of 10 Malaysian adults suffer from gum disease (NOHSA 2010). In a recent study conducted by Lion Corporation on 450 Malaysian adults showed 80% of respondents had at least one visible signs and symptoms of gum disease, most common being bleeding and swollen gums but only 1% realise that they have gum disease (Project Katsu 2017). The main cause of gum disease is plaque the soft sticky film containing billions of bacteria. When plaque builds up in between teeth, along the gum line and inside gum pockets, the toxin from the bacteria will damage the gum tissues. Gingivitis is the early stage of gum disease where the gum is swollen and inflamed and bleeding during brushing due to the bacterial infection. If left untreated, it will progress to gum disease. Gum disease does not only cause tooth loss, but it is linked to other health issues like diabetes and heart problems. Lion Corporation Japan’s foray into the oral care industry started back in 1896 with the introduction of the tooth powder. Ever since then, oral care has been the core business and Lion Corporation Japan’s expertise is backed by more than 100 years of experience working with dental professionals and having their own dedicated team of experts and scientists. 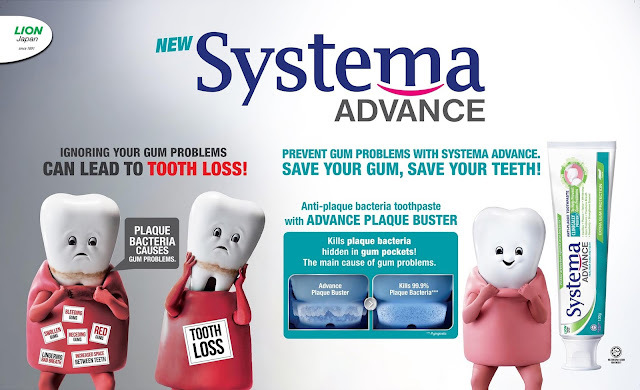 SYSTEMA understands the widespread issue of gum disease. With the in-depth understanding of oral needs and thorough consumer research, SYSTEMA is now launching Lion Japan’s biggest breakthrough; SYSTEMA ADVANCE, the first anti-plaque bacteria toothpaste with Advance Plague Buster technology combining TDS, IPMP to breaks down plaque and kills 99.9% bacteria in hard to reach area especially inside gum pocket and GK2 to soothes gum discomfort. SYSTEMA ADVANCE Anti-Plaque Toothpaste comes in 3 variants which are SYSTEMA ADVANCE Extra Gum Protection that has a fresh aromatic peppermint flavour with a spearmint note, SYSTEMA ADVANCE Deep Clean Whitening which has a longer lasting mint flavour with particles in the paste and SYSTEMA ADVANCE Extreme Clean Breath that provides fresh double mint flavour with long-lasting cooling technology for longer feeling of fresh breath. Now, Systema is able to provide a comprehensive SYSTEMA Anti-Plaque System of toothbrush and toothpaste to help keep gums and teeth healthy for life. SYSTEMA ADVANCE Anti-Plaque Toothpaste to break down plaque and kills bacteria inside gum pockets while Systema 0.02mm super tapered bristles toothbrush aid in the physical removal of plaque from the hard-to-reach areas especially in between teeth, along gum line and inside gum pockets to help keep gums and teeth healthy for life. More importantly, through Preventative Dentistry, Systema aim to educate and equip Malaysian consumers with better oral health knowledge through continuous oral health campaigns towards a quantum leap in better oral health for all. In conjunction with the launch of SYSTEMA ADVANCE Anti-Plaque Toothpaste, Systema kicked off a Nationwide gum health awareness campaign held in collaboration with the Oral Health Programme, Ministry of Health Malaysia (‘MOH’), the Malaysian Society of Periodontology (‘MSP’) and the Faculty of Dentistry, Universiti Teknologi MARA (‘UiTM’). Themed “SAVE YOUR GUMS, SAVE YOUR TEETH”, the campaign was officiated by Dr. Nomah bt Taharim the Principal Director of Oral Health, Ministry of Health Malaysia. This oral health campaign is to encourage the public to take the first step towards attaining healthy gums by getting their gum checked in an effort to alleviate gum disease. There will be Mobile Dental Clinics provided by MOH and UiTM which will be touring various locations across Malaysia where the public will be able to participate and get their gum-health checked for free. This campaign further enhances Lion Corporation Japan’s mission to raise awareness and educate the community on gum diseases and good oral health care. In the spirit of helping more Malaysians to achieve healthy gums and teeth, SYSTEMA pledged 30,000 SYSTEMA ADVANCE Anti-Plaque Toothpaste samples with gum health educational leaflet for the “SAVE YOUR GUMS, SAVE YOUR TEETH” CAMPAIGN. The SYSTEMA ADVANCE Anti-Plaque Toothpaste will be provided to the community through the Malaysian Society of Periodontology and UiTM at the on-ground gum check activity thus further enabling Malaysian consumers to achieve healthy gums and teeth for life. 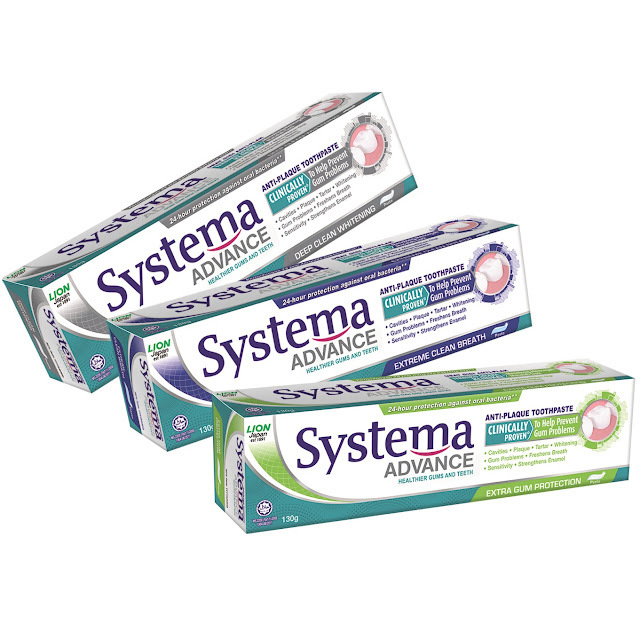 SYSTEMA ADVANCE Anti-Plaque Toothpaste is now available in all leading stores and pharmacies nationwide at RM12.55. Now, achieving healthy gums and teeth is easy with SYSTEMA. Good oral health care practice does more than just protect your teeth; it is a great start to healthy gums which will lead to a healthier life! Southern Lion Sdn Bhd is a joint venture company between LION CORPORATION Japan and Lam Soon (M) Bhd. It started its operations in April 1987 and grown to today’s position as the No.1 Detergent Manufacturer in Malaysia with many leading brands like TOP, Bio Zip, Shokubutsu, Systema, Fresh & White and Kodomo. Southern Lion strives to continuously improve the quality of life of consumers by offering them products of innovative concepts at affordable prices.